There are times when I feel that I must be one of the worst golfers in the world (though I am delighted to have won two turkey prizes in the past few weeks! ), but this compilation video shows me that I do not come anywhere close. I’m a more responsible cart driver too! 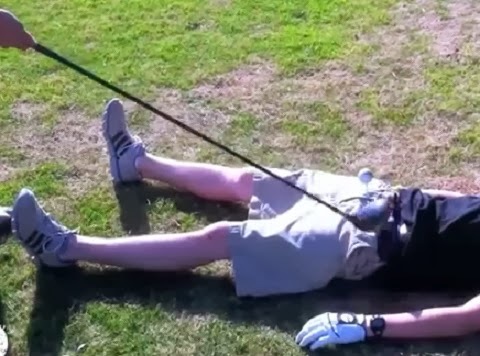 Click here for the Ultimate Golf Fail Compilation on YouTube. Caller: Yes, we have a tee time for two weeks from Friday. What's the weather going to be like that day? Caller: Yes, I had a tee time for this afternoon but I'm running late. Can you still get me out early? Caller: Yes, I'd like to get a tee time tomorrow between 12 o'clock and noon. Staff: Sorry, we're all out of large balls. But we can give you twice as many small balls for the same price. Caller: Something between 9 o'clock and 10 o'clock. In the morning, if possible. Caller: Yes, I'd like some info about your golf course. Caller: I don't know, that's why I called. Wishing all of my readers a Merry Christmas and Happy Holidays, wherever in the world you play your golf. If you enjoy receiving my weekly blogs you might pass on my contact details to others that have an interest in the Rules of Golf. There is a ‘Subscribe via email’ box at the top right hand corner of every page of my web site.